A trip to Armenia may very well feel like a journey back in time, yielding the treasures of an ancient land that became the first Christianized country in 301 CE. Landlocked and mountainous, Armenia features a varied scenery that quickly shifts from extremely dry landscapes to dense forests carpeting steep foothills of the Lesser Caucasus. Perhaps the highlight of a vacation in Armenia, the mountains are ideal for hiking and any other outdoor activity you can think of. National capital Yerevan remains one of the world's least-explored ancient cities; spend some time here to discover the bulk of Armenia's museums and other cultural venues, which narrate the rich story of an often-troubled region straddling two continents. Kotayk Province: Located in the heart of the country, the region combines ancient sites dating back to the first century BCE, with winter and spa resorts making it a perfect combination for anyone who loves adventures on the mountain and learning about history on the way. Shirak Province: The northwest part of the country is characterized by Armenian natural beauty, with mountain meadows surrounded by an alpine landscape covered by lush green and red forests throughout the year. Tavush Province: For tours of ethnic villages, head to the northeast part of Armenia and experience life in the university cities in Tavush, as well as the mineral water springs and sanatoriums that set this region apart from the rest of the country. Syunik Province: The land of wildlife sanctuaries with a plethora of archeological attractions, this province supports many endangered species and showcases prehistoric sites and religious monuments from the middle ages. Lori Province: Home to several World Heritage Sites, this province is packed with well-preserved monasteries and religious sanctuaries that draw in thousands of pilgrims each year. 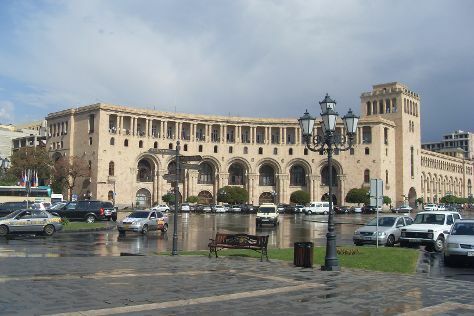 Yerevan: Often the starting point of an Armenian holiday, “The Pink City” showcases the fast pace of the capital, with its Neo-Classical streets mixed with Soviet-style architectural elements as well as many museums, galleries, and peaceful parks. Geghard: Listed as a World Heritage Site, the small but popular medieval village lies on a mountainside and draws in visitors with its complex structure and intricate towers. Dilijan: The city often called “Armenian Switzerland” and its rustic-style streets provide a place of escape for people who want to experience fresh air in the national park that surrounds the town. Tsakhkadzor: Soak up the serene atmosphere at this mountain retreat by visiting the many memorials and monasteries nearby, or let your inner adventurer have fun on the ski slopes. Jermuk: The main source of mineral water for the entire country, the city is known for its relaxing vibe of spas and monasteries, as well as the archaeological fortune. Yerevan Cascade: See the transition of Armenia into a new age from the Soviet rule at Yerevan Cascade (the stairway building) as you take in views of the city as well as Mount Ararat from the top of one of many balconies and platforms. Republic Square: Imitating the weaving of an Armenian rug, Republic Square represents the main place where cultural events happen; it stands surrounded by pink and white buildings which give the city its famous nickname Pink City. The Monastery of Geghard: Built into the mountain, the Monastery of Geghard complex highlights the site’s structure with its medieval towers, churches, and secrets worthy of World Heritage Site status--a must-see on your travel itinerary. Garni Temple: The Greek style Garni Temple stands proudly as a testament to the pre-Christian period of Armenia, built in the first century BCE in honor of the sun god Mihr. Matenadaran - The Museum of Ancient Manuscripts: The home to an extensive collection of manuscripts ranging from topics on art, to literature and medicine, Matenadaran--The Museum of Ancient Manuscripts--shows the importance of ancient books and features statues of national scholars. Khor Virap: The reclusive site where the patron saint of Armenia Gregory the Illuminator was kept prisoner, Khor Virap draws thousands of pilgrims each year wanting to see the dungeon under the chapel floor where the saint gave his life for his beliefs. Tsitsernakaberd: Commemorating Armenian genocide victims, Tsitsernakaberd features location names where the war crimes took place as well as an eternal flame that honors those who died. Armenian Genocide Museum: This museum combines outdoor and indoor exhibitions in order to educate visitors about the horrors of war and commemorate the 1915 genocide victims. History Museum of Armenia: Opened in 1920, the History Museum of Armenia features not only archaeological artifacts, but modern history photographs, books, and items alongside works of domestic and international art. Tatev Monastery: Massive walls of a fortress overlooking a river--reminiscent of medieval education--and the tomb of the last Armenian saint are just some of the things that set the Tatev Monastery apart as a place of intrigue and history. The best way to get a taste of Armenia is to sample the country’s cuisine during your Armenian holiday. Give khash (a regional soup) a chance and try the traditional dish from Shirak Province. Spreading further than the local level, lavash (traditional thin bread) with a special kind of nutritious yogurt called matsun make a healthy breakfast. Armenian cooks specialize in various soups such as borscht, which is made with beetroot in a combination with other vegetables, and grainy kefir soup spas. Take home a piece of history from your trip from flea markets or open-air sites like Vernissage Market. Browse through lines of market stalls to find treasures including handicrafts, carpets, and duduks (which are listed as Intangible Cultural Heritage by UNESCO). Try cognacs, homemade food, and fresh fruit available at any of the markets; remember to bargain for a deal. For an upscale experience, include a walk down Northern Avenue Pedestrian Street for some retail therapy at international brand stores. ●	Armenia is one of the oldest wine producing countries in the world, with the oldest discovered winery dating back to 4000 B.C. Avoid conversations about Nagorno-Karabakh and Azerbaijan alongside any political topics as the past genocides and current state affairs are tense to this day. Except their passionate love for history and their cultural heritage, Armenians are conservative and predominantly religious, so dressing modestly is recommended for women, especially when visiting churches or any religious monuments and sites. Avoid walking alone late at night, since that can draw unwanted attention on your vacation. Time your visit to include one of the many festivals in your travel itinerary, as they show a unique side of the culture. In addition to official state holidays, Armenians celebrate a variety of religious and cultural events. Reminiscent of paganism, Vartavar takes place countrywide on July 14, World of Water Day, when children have the task of dropping buckets of water onto people for fun and good luck. But the whole country comes together during March every two years to celebrate the idea of “One Nation, One Culture” to heal the wounds left after the genocide; this is often done with the help of literature and poetry, rather than rituals. A simple handshake is all you need to get to know the locals on your trip, but women sometimes kiss on the cheek if they are familiar with each other. Keep in mind that Armenians are welcoming and do not need a lot of personal space--they may stand really close to you during a conversation and even brush your shoulder or hand. Often referred to as a sunny country perfect for a vacation, Armenia showcases a highland continental climate, with a dry climate prevailing. Temperatures range from season to season with some parts of the country rising to 40°C (104°F) during summer. July and August are the warmest month, while December, January, and February offer the typical continental winter wonderland. Within towns and cities, walking is the prime mode of transportation in Armenia. Take a walking tour around the city you’re staying in to get a feel for the vibe of local history; to reach faraway locations, opt for a taxi or check schedules for the regular bus lines that serve your destination. Trains are often late and slow since they date back to the Soviet era. Learning a few phrases in Armenian will help you communicate and delight the locals, since the development of tourism brought English only to big cities like Yerevan. In the rural parts of the country, the local population is fluent only in their mother tongue (and sometimes Russian left over from the Soviet period). For good service in a restaurant or cafe during your Armenia holiday, tip about 10 percent of your bill to the wait staff or bartenders. Avoid sitting in restaurants that charge a service fee, as that money rarely goes to the servers. Taxi drivers expect you to round up the figure to the next bill. On the other hand, Armenian tour guides do not expect any tips.